Flaxman Moalusi Jacob Qoopane, who has just died, always had a palpable ambience of joie de vivre around him - and his extraordinary love for books, authors, literature, and libraries nourished this patina of exaltation. Qoopane for decades had an astonishing career as a colourful, enterprising journalist, columnist, poet and author of several works. His shorter works were published in dozens of newspapers, magazines, journals and general books. It is no surprise that news of his passing continues to shock the world, with the literary fraternity rocked and devastated. Ishmael Mzwandile Soqaga, the well known literary critic reacted spontaneously: "So Flaxman has departed this world? I am crying now with poignant sorrow...he certainly played his part. Africa must celebrate this important literary figure,"
Charmaine Kolwane Mrwebi, the avant-garde poet, literary activist and publisher, was more philosophical. "Our Literary Father is Resting, Father of Letters...We are Praying for his Family" she said. Nthabiseng Jah Rose Jafta, fecund poet and Creative Writing Mentor/Facilitator, said: "It is really sad. Ntate Qoopane was there for us since we were very young. We remain eternally grateful,"
Raphael Mokoena, another literary critic, averred: "Qoopane contributed prodigiously to African writing in particular. He unearthed, introduced, wrote about countless writers and poets over the years. He was a celebrated poet. He published many books of different genres: biographies, essays, criticism, general profiles, and epistolary"
Indeed, many of Qoopane's published books have been internationally digitised by lofty universities/literary centres. Flaxman also orchestrated the Qoopane Literary Gallery whose magnificent contents should now be taken over and preserved by the powers that be, as part of his sterling legacy. Two years ago, Qoopane turned 60, and as part of the events marking the occasion, Charmaine Kolwane put together a book of essays, poems, articles, critiques etc all celebrating the remarkable Flaxman Qoopane (FATHER OF LETTERS). Literary pundits are now calling for the book to be stocked in every conceivable library. "Our people - new generations - must read about this man whose life celebrated books and literacy" a tearful Soqaga stressed. A loss as saddening as it is chastening. RIP, Sir Qoopane. I found myself crying like a baby when I read this. I have a blog on books, and Pa Qoopane was "Mr Books" himself. We really didn't wait for this sad moment of passing of one of the legend of literature Mr Qoopane. We were hoping that he will be fine and continue to do what he love. But we will continue to learn from his wealthy legacy. Heaven is definitely richer with you there Mr Qopane. In life we loved him dearly and in death we love him still. In our heartshe hold a place,no one else will ever fill. Death be not proud. Rest in peace Father of letters we will see you in the morning. Thank you for this 'Tribute' article Malome. Hoping his wife and kids wil find comfort and indeed SA and the continent. Will remember his flamboyant laughter and loudness. But mostly his journalistic charisma and vibrancy. We can draw so much from his work ethic. 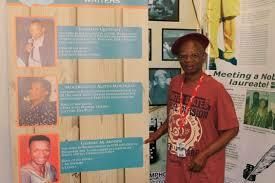 Rest in literary peace Ntate Qoopane. The thing is, everybody agrees how much the late Mr Qoopane loved books. It is legendary, from his youth, his days in exile, and back at home. He even started a wonderful world class literary gallery. Such a man is so rare that we can use tbe word unique to describe him. It is also agreed by all that he should be celebrated, his legacy made somewhat permanent. A superb professional tribute, apparently almost detached. The inevitable swamping sentiments are transposed onto other protagonists here. Good to see full list of the great man's major published works here. It is a pity, when an important writer dies society becomes diminished. It is obvious that Mr Qoopane was a distinguished man of letters. It is a painful loss for Africa as a whole. 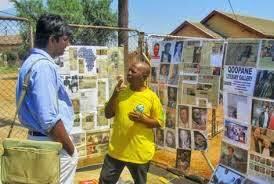 My last encounter with him in Bloemfontein was very interesting as he spoke about working together on a project but sadly time beat us to it. What a gentleman he was, filled with humility and energy. I was hoping that one day we could have a second edition of his book on the Perspectives on your literary work. A comprehensive voyage to your work from a legendary writer perspective. Great tribute Chief Seye. 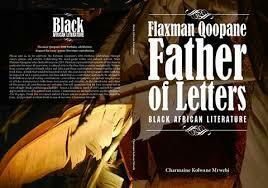 It is too shocking and sad to learn about the demise of Flaxman Qoopane the genuine prominent African writer. Although it is too difficult to express the pain and sadness one feels however I am very encouraged by many comments on O. Bolaji tribute to Flaxman Qoopane. Flaxman Qoopane was a true warrior of grassroots literature; I am very pleased to know him personally, converse and to read his books is again another enchanting thing to remember-great man indeed. Robala Ka Kagisho Mo Afrika.